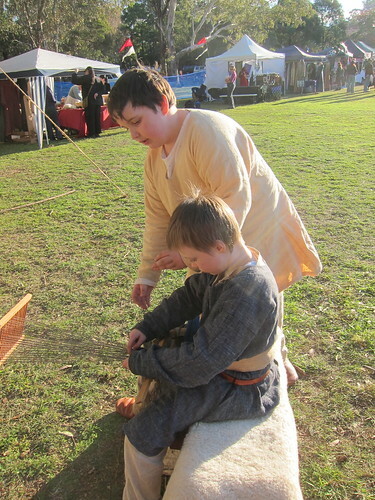 On Saturday morning we got up at 6:30am, bundled the last few bits and pieces, the kids, and the dog into the car and headed off to Parramatta Park for two days of fabulous reenacting fun. We didn’t camp overnight but I sort of wish we had, it sounds like even more fun was had once the sun set and the mead came out! 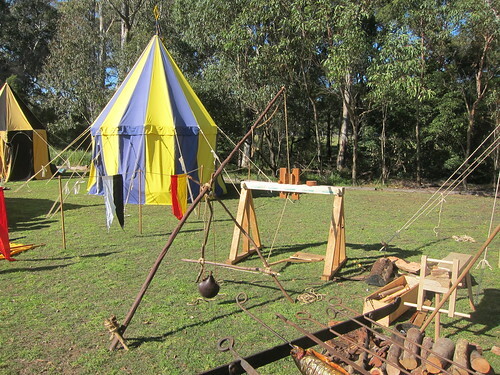 Adam had rebuilt his pole lathe to get rid of the non-historically accurate bolts holding it together, it attracted lots of attention from the public. Unfortunately I failed to get any photos of him using it. 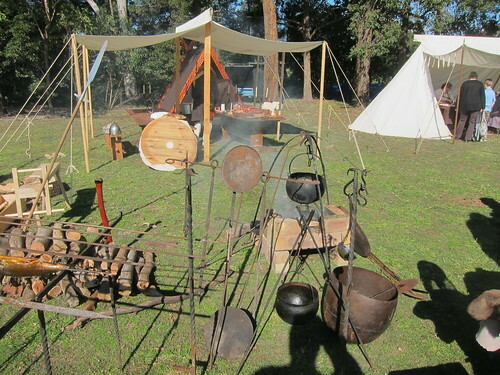 We were camped with The Huscarls as the Ancient Arts Fellowship had decided to give the event a miss this time. 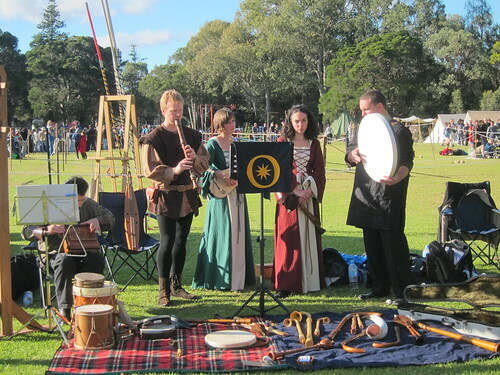 Across from our encampment was The Orion Consort, a Medieval and Renaissance music ensemble who play on period instruments, they provided a most enjoyable auditory backdrop to the event. Wish I could play my gemshorn as well as them. 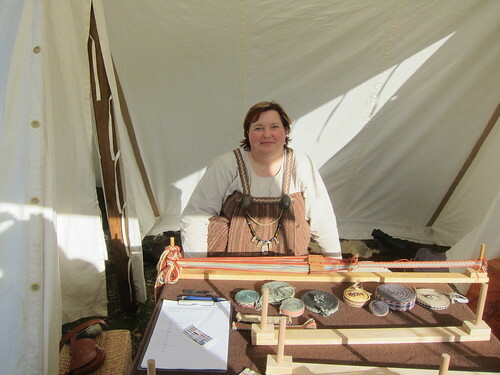 My offer of tablet weaving lessons was taken up by a few people on each day, I had lots of fun teaching them, I love the thrill people get (including me!) when you start to weave and the pattern magically appears. Clara had the best time ever with an endless stream of new people to say hello to. 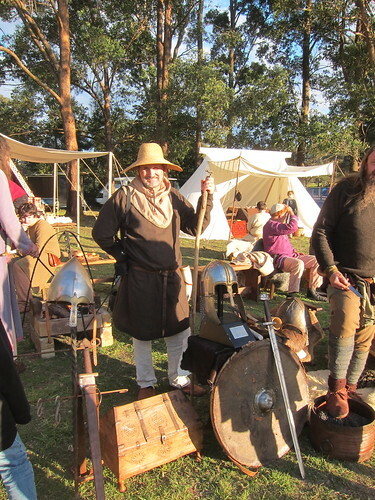 Dirk and Dave between them provided food for the Huscarls’ camp. 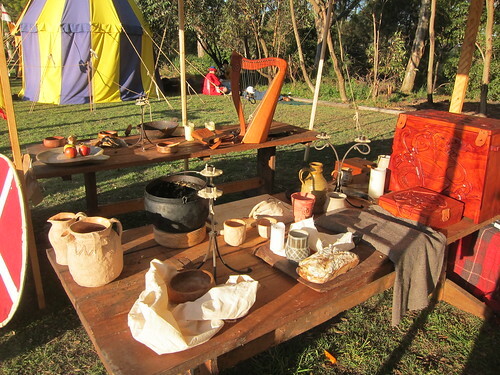 There were stews, a very tasty barley porridge, breads, cheeses, nuts, fruit and cold meats. On Sunday we brought along two freshly baked sourdough loaves to add to the repast. 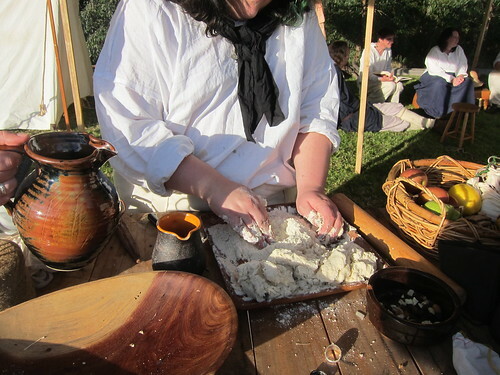 Other groups were also doing period cooking on-site, here one of the members of SMAC (Society of Merchants, Artisans and Combatants) is making duff – a mix of flour, lard and water which can then be flavoured with sweet or savoury additions. Full Flight Birds of Prey were there doing a falconry display. 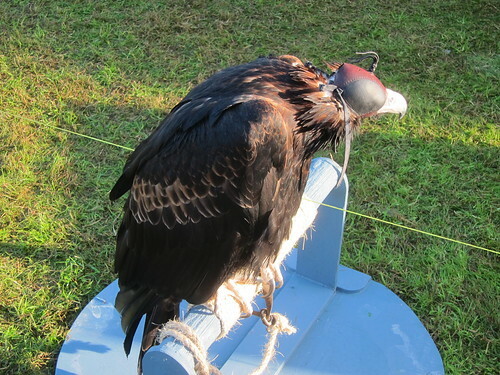 On Saturday afternoon I got to give the wedge-tailed eagle a neck rub, then on Sunday Tom completely upstaged me by being allowed to actually HOLD the eagle. But we don’t have any photos because neither Adam or I was there with him. 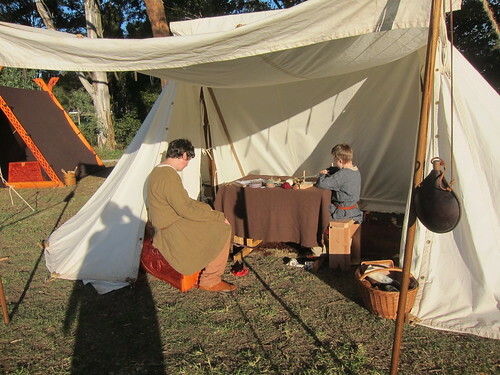 One of Tom’s friends came with us on the Sunday, they had a great time wandering around and seeing all the displays, finding all the other reenactors’ kids to play with and playing Magic: The Gathering at the Infinitas stall. 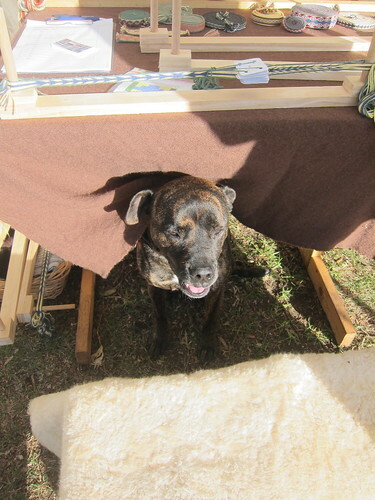 Tom’s friend was very keen to try all the crafts, we had to say no to having a go on the pole lathe as it was the wrong height for him but he took to tablet weaving with enthusiasm. Tom got out his long-neglected backstrap weaving. And then ended up teaching his friend how to do that too! Not a bad way to spend a weekend really, not least because the weather was just amazing – we’d had several grey and rainy days leading up to the weekend and had been rained on while packing the car on Friday night, but look at all that gorgeous sunshine! Doesn’t look very wintery at all. Find out what’s been going on in other places all over the globe by dropping in to Unknown Mami’s place for everyone else’s Sundays in My City posts! you guys are sooooooooooooooo cool!!! What a fun time. I love the pic of you near the loom ~ very nice. Indeed! 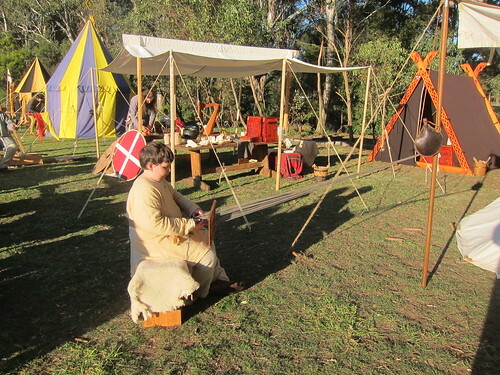 Pure wool and linen for our period and area, 800AD to 1066AD England and northern Europe. 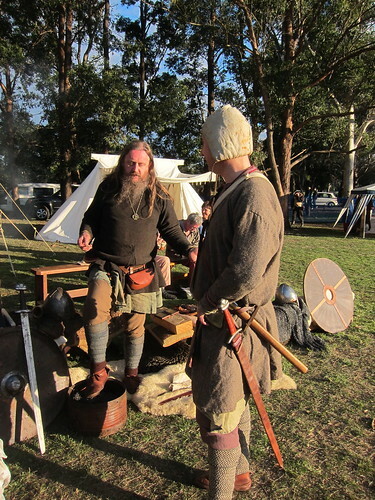 It does sometimes get cold enough in Sydney around this time of year to make wearing the whole kit, cloaks included, comfortable, but if it was like that for the event then there’d be no members of the public coming along! Looks like everyone had a great time. Have a great day! Looks like a lot of fun. So nice to see folks passing down arts/crafts to their kids and sharing them with the public! It’s one of the best things about the hobby to my mind 🙂 My favourite events are the ones where there are heaps of workshops you can go to and learn new skills. Oh my goodness! You must LOVE doing that, ’cause it looks like a TON of work to me! I do sometimes wonder if I have rocks in my head as we struggle to get everything ready 🙂 But it always seems worth it once we get there! Wow – what a weekend! Thanks for walking us through with all those pictures – it really gives a good feel for the fair. The period costumes adn your weaving are fantasic. That looks sooooo cool. What an amazing time, and so much fun! Beware! 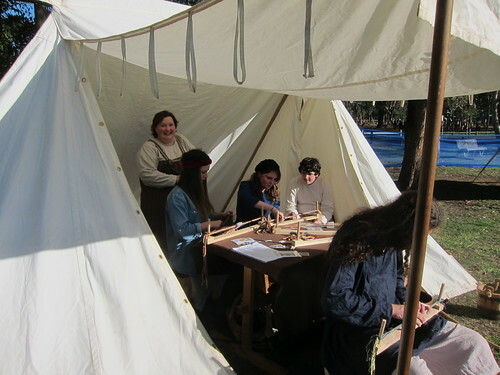 That’s what we thought the first time we went to Winterfest and saw The Huscarls doing their thing – that was in 2007 and we’d never really encountered historical reenactment before – and look where we are now! What a great day you must have had! I love reading about other peoples interesting hobbies. The food looks awesome. I totally misread your first sentence. My mind read something totally naughty and I was like WHAT, I CAN’T BELIEVE SHE WROTE THAT, then I read it again and it made much more sense. There’s no doubt about it, The Huscarls eat well. The beef stew we had on the Saturday was so good, if I can get the recipe from Dave I reckon it’ll go on high rotation in my kitchen for the rest of winter. Thanks for sharing this kind of unusual happening. 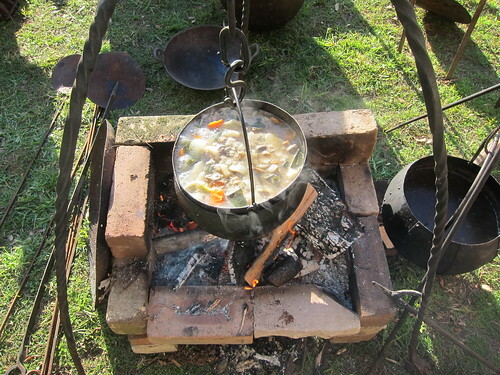 I’m sure you’d love Seurasaari open air museum in Helsinki…(just google Seurasaari). I think you’re right, Seurasaari looks fabulous!